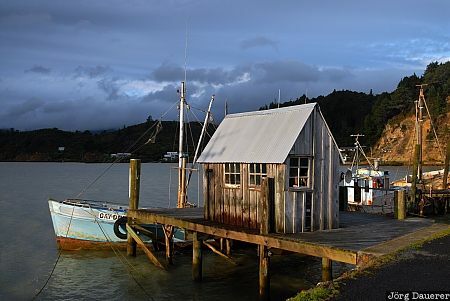 A boat shed near Coromandel Town illuminated by the last light of the day. I was lucky that the sun broke through the clouds for a few minutes in the evening to briefly illuminate the boat shed and the boat. Coromandel Town is on Coromandel Peninsula, Waikato, on the north island of New Zealand. This photo was taken in the evening of a cloudy day in October of 2008. This photo was the image of the month in September of 2009. This photo was taken with a digital camera.